We all have troubles. We all have bad days. We all have difficult circumstances to deal with. We all face obstacles in life. But if you are a Christian, you have resources available to help you cope and to help you deal with these things. And we have Scripture to help show us the way as well. We find many great saints in the Bible who went through some very trying times. Many of them have gone through really gruelling things that most of us will never face. Consider David. He sure had his fair share of hardships, trials and tribulations. Consider one such episode which I just again read through. Imagine that you are a ruler, and the enemy comes into your land, destroys a key city, and takes captive the wives and children of you and your men. As if that is not bad enough, then your men get so upset about this, they begin to threaten to kill you! Um, just how would you cope in such circumstances? Most of us would give up in despair, or run away and hide, or tell God that he stinks and that we will no longer bother serving him. Well, this exact tragedy befell David, but his response was quite different from how most of us would have responded. David and his men reached Ziklag on the third day. Now the Amalekites had raided the Negev and Ziklag. They had attacked Ziklag and burned it, and had taken captive the women and everyone else in it, both young and old. They killed none of them, but carried them off as they went on their way. When David and his men reached Ziklag, they found it destroyed by fire and their wives and sons and daughters taken captive. So David and his men wept aloud until they had no strength left to weep. David’s two wives had been captured – Ahinoam of Jezreel and Abigail, the widow of Nabal of Carmel. David was greatly distressed because the men were talking of stoning him; each one was bitter in spirit because of his sons and daughters. But David found strength in the Lord his God. Talk about a godly way to respond to a major crisis! What great lessons we can learn from this. Indeed, that is just what I intend to discuss here, but first, a bit of background information. Judah was promised the town of Ziklag as an inheritance by Yahweh (see Joshua 15:1, 21-32 and 19:1-9). But when Saul reigned as king it was still under the control of the Philistines. As we read in 1 Samuel 27:1-7, with Saul seeking to kill David, he fled to the land of the Philistines and the king there, Achish, gave David and his men the town of Ziklag. He stayed there for nearly a year and a half, until he moved to Hebron to become king of Judah (2 Samuel 4). It turns out the city was destroyed by the Amalekites when David was away with his men (1 Samuel 29). So that gives us the background to this story. Now let me offer some commentary on all this, especially devotional commentary. One always trustworthy guide in providing meaty spiritual commentary on various Old Testament texts is Dale Ralph Davis. He has penned devotional commentaries on Joshua, Judges, 1 Samuel, 2 Samuel, 1 Kings, and 2 Kings, among others. The problem with the disaster at Ziklag is that it is not an isolated one. For David the pounding had been going on since 1 Samuel 18. Yet it seemed more unbearable given its immediate context [the amazing deliverance from an emergency (29:1-11)]… The yo-yo effect seems to make the battering more excruciating. A marvellous escape, a moment to breathe, a grand relief – only to be thrown into the pit again. Never since his flight from Gibeah and Saul had David stood so alone, though he had often been in danger of death, but David strengthened himself in the Lord his God. Far from blaming God for allowing the destruction of the city, David took the reprisal of the Amalekites as one of life’s hazards, in which he could draw on the resources of a faithful covenant Lord. As the psalms attributed to David assert over and over again, David poured out his feeling freely in prayer: ‘I am lonely and afflicted. Relieve the troubles of my heart, and bring me out of my distress’ (Ps. 25:16-17) could have been composed in a situation like this. Another thing pointed out by many commentators is how adeptly the historian in these chapters highlights the very real differences between Saul and David. Both are in great distress and in dire circumstances. But Saul ends up consulting a medium at Endor after the Lord does not answer him (1 Samuel 28), while David trusts only the Lord and consults Abiathar the priest and the ephod (1 Samuel 30:7-8). Let me offer one final note of encouragement here, again utilising the wise words of Davis. He reminds us that the Bible is realistic: it does not hide from truth nor offer false advertising. It makes it clear that God’s people WILL suffer and have distress. some kind of gospel magic. It is not a quick fix. It is not recognising that the pressure is on and so deciding to seek help in religion. The Lord is not a genie you rub in trouble in order to make you feel better. Jesus is not your personal pain reliever to get you on top of life’s aches. Strengthening yourself in the Lord is nothing so superficial or superstitious as that. He looks at other things it is not, then offers some clues as to what it is. The text “implies that you strengthen yourself in Yahweh by remembering the promises that pertain to you and the affirmation about Yahweh’s character.” It implies we have a role to play in this. The verb translated in the NIV as “found strength” involves a reflexive element (cf. 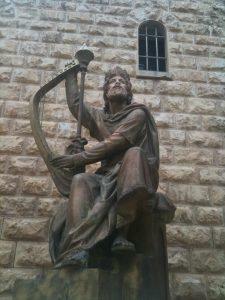 NRSV “David strengthened himself in the Lord his God”). This expression emphasises David’s personal faith – and does so in a way that illustrates the synergistic nature of faith. That is, faith requires a human response, though it is enabled by God (cf. Eph. 2:8). Even though God graciously makes faith possible, it is up to us to respond to his grace. The Christian does not have Abiathar nor the ephod. Yet the same resource recourse is open to him. For he does have a priest, a greater than Abiathar. “Since then we have a great high priest who has passed through the heavens, Jesus, the Son of God, let us hold fast our confession” (Heb. 4:14 RSV). Because we have such a priest we are confidently to “draw near to the throne of grace, that we may receive mercy and find grace to help in time of need” (Heb. 4:16 RSV). We may not get precise answers to our questions but we will find “grace to help,” which we usually need more than answers. I don’t often need information but endurance; I don’t need to know something—I only need to stay on my feet. Use your Priest; use your access; it’s part of strengthening yourself in Yahweh your God. 6 Responses to And You Think You’re Having a Bad Day! Hi Bill, In Psalm 55 David, when feeling broken prayed “Oh, that I had the wings of a dove, I would fly away and be at rest”. I feel like doing that in certain circumstances, as I’m sure others do as well. I can certainly feel overwhelmed at times as a certain fb friend maybe feeling right now. David says,’As for me, I call to God and the Lord saves me’. Sometimes we just need strength to cope with every minute of each day. I weep for those that have to struggle under extremely difficult situations. May God answer our prayers for those who suffer and have much distress. One thing that can’t be levelled at the Bible is that it looks like a history book written by the victors. It seems like a book written with a level of honesty that defies human ability to be so uncompromisingly honest. Yet, we know it was written for us as a book to inform us the one who inspired it has the victory that awaits us. We live in privileged times since we not only know we have ultimate success, but we know by what means and by whom. We, like an old man I had tea with today, are having to crawl out of the trenches burdened with loss and grief for those left behind to make our way home, only to find streets that were once our playground, was now a heap of rubble and bomb craters. What we left to fight for, died alone in one of those heaps of rubble that was once home. It seems we are sometimes walking a tightrope above the abyss and can’t be burdened with one more brave man’s recollection of despair, that should have been a romantic ending. The cries of an innocent baby in a war where it doesn’t even have a trench to take cover in is unbearable to comprehend. Then, the history book that does not hide that utter despair, informs us, yes you are walking a narrow tightrope, but do not forget child you are to keep looking forward and not down, as down is of no concern of yours as my safety net is there for you, walk on child, walk on. The grim spectre of Amalek features in the Ziklag disaster: Saul lost the LORD’s support for failing to do what he was told to the Amalekites. Thus they remained a threat to David and his band of political refugees. Hiding in plain sight amongst the old Philistine enemy was always bound to have its risks. When things went bad, when conflict came, as it did at Ziklag, David did not wallow in self-pity but ‘strengthened himself in the Lord’ and pursued the Amalakites and rescued the kidnapped women and children. In the very next chapter Saul is killed in battle and David becomes king. Dealing with conflict is preparation, not punishment. Like David, our lives need to be an inspiration to those who watch us deal with the trials and conflicts that arise.